Purslane (Portulaca oleracea, gr. glistrida, antrakla, adrahni) is a plant with fleshly leaves, growing wild all over Greece and also cultivated for use in horiatiki salad or eaten by its own with olive oil and vinegar. 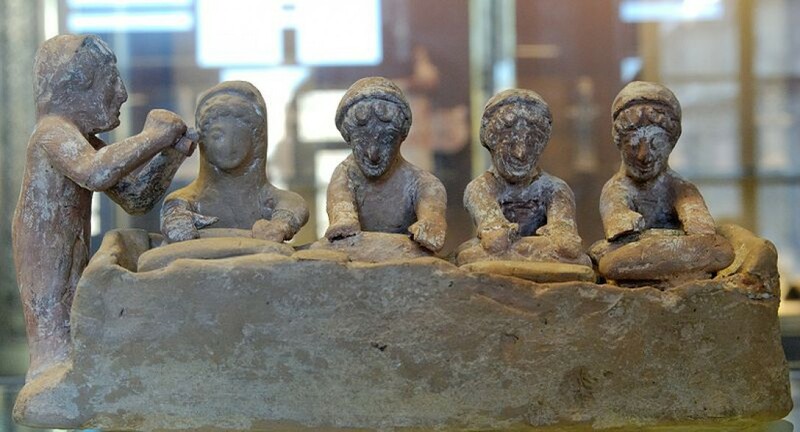 Archaeobotanical researches have retrieved purslane seeds from a protogeometric layer in Kastanas and the Samian Heraion (7th century BC). Ancient doctors and herbalists found purslane helpful in treating inflammation in the urinary system (Hippokrates), mouth (Galen), digestive tract (Dioskourides) etc. Dioskourides thought that it could reduce the sexual desire, an opinion that was widely accepted until 17th century. The 17th century monk Agapius Landus from Crete suggested a fresh green salad made with purslane, basil, rocket, cress, and garlic to those suffering «the common cold». Modern researchers found that purslane is one of the very few plants that contain alpha linolenic acid, a type of omega-3 fatty acid normally found in fish and some algae. It is an explosion of vitamin C, also contains some vitamin B and carotenoids, as well as minerals, such as magnesium, calcium, potassium and iron. Two types of its betalain alkaloid pigments, the reddish betacyanins and the yellow betaxanthins have been found to have antimutagenic properties in laboratory studies. 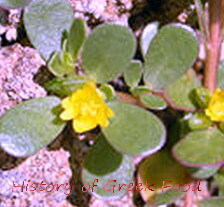 Although purslane is widely eaten raw or pickled in vinegar by Greeks, is rarely consumed cooked. Two Cretan recipes of lamb or chicken cooked with purslane could have been introduced by the Greek refugees from Asia Minor, since in Turkish cuisine purslane is used just like spinach. A salad with yogurt and purslane also reminds of the Turkish Yogurtlu Semizotu Salatas. 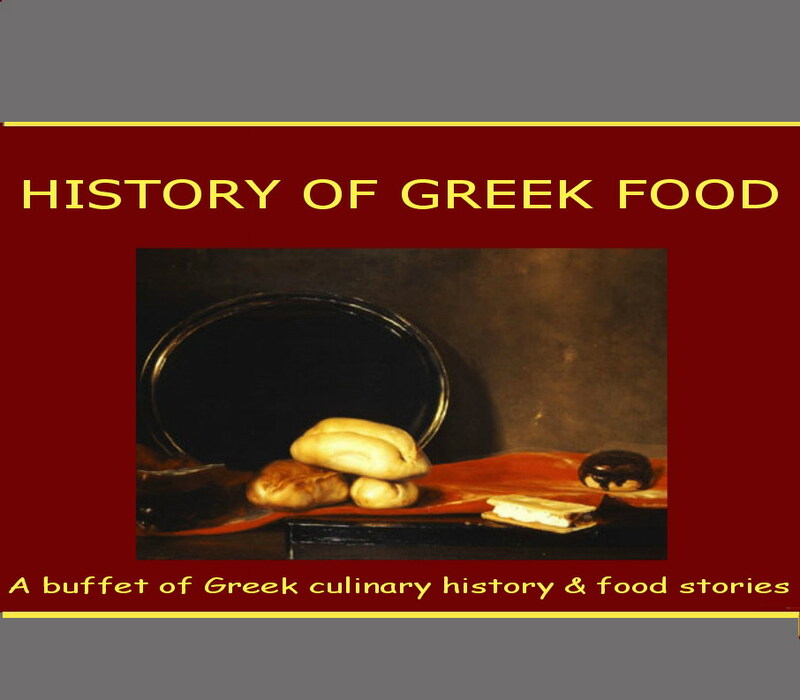 However, in that case it could be a coincidence, one of those that happen to cuisines based on similar sources. ½ cup green olives preserved in lemon without pits, cut into rings. Mix yogurt, garlic, olive oil, vinegar and olives in a bowl. Add purslane and mix again. Add salt and pepper to taste. Refrigerate for at least 1 hour or until it is time to eat. Serve it with bread or with any roast or grilled food. Previous Post WHAT DOES TRADITIONAL MEAN? with so much growing wild in the garden, it’s a blessing that it’s edible! I tried this when I was very young and didn’t like it very much so I never bothered to try it again. Reading your post I really want to give it a second chance. Thanks. I just adore purslane! Although I have it as a weed in my garden, I’ve actually bought seeds for and grown the nicer bigger variety. My introduction to it was being served grilled fish on a bed of purslane. I think I ate the entire bed! By the way, Mariana, I heard back from the Archipelago people. They said that they were still just in the collection phase with the seeds, and are not offering them for distribution yet. But it sounded like maybe they would offer them in a couple of years. Maria, only in my garden the purslane disappeared. Ivy, when I was child I hated purslane. When I was 20 I tried a cooked version and since then I adore it. By the way, a friend from Syria gave me a delicious tabbouleh recipe that calls for purslane. Lulu, I find the purslane bed very tasty. Thanks for the Archipelago information. I may get some seeds of waterless tomato and watermelon from Zakynthos at the end of the summer. I will let you know. Marianna, I bought some purslane this week from the farmers’ market and I am posting about it today. I shall be putting a link to your post. BTW, I just noticed that you’ve put me in your blogroll. Thanks very much.